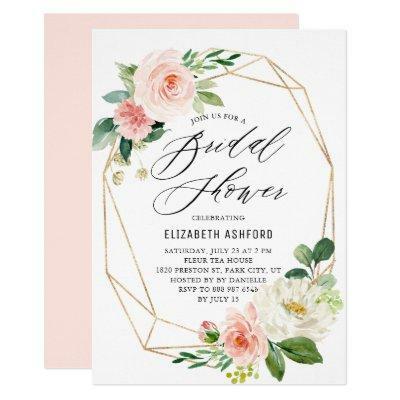 Geometric Gold Frame and Peach Watercolor Florals Bridal Shower Invitation. Customizable bridal shower invitation featuring watercolor romantic peach and white flower bouquets with greenery and faux gold foil geometric frames. This floral bridal shower invitation is perfect for spring and garden bridal showers.